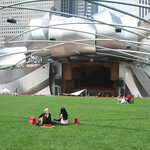 I was in Chicago last weekend for the Travel Blog Exchange Conference where I met with other travel bloggers. Just out the window of the Chicago Cultural Center where the conference was held is a sculpture that has become iconic for Chicago. 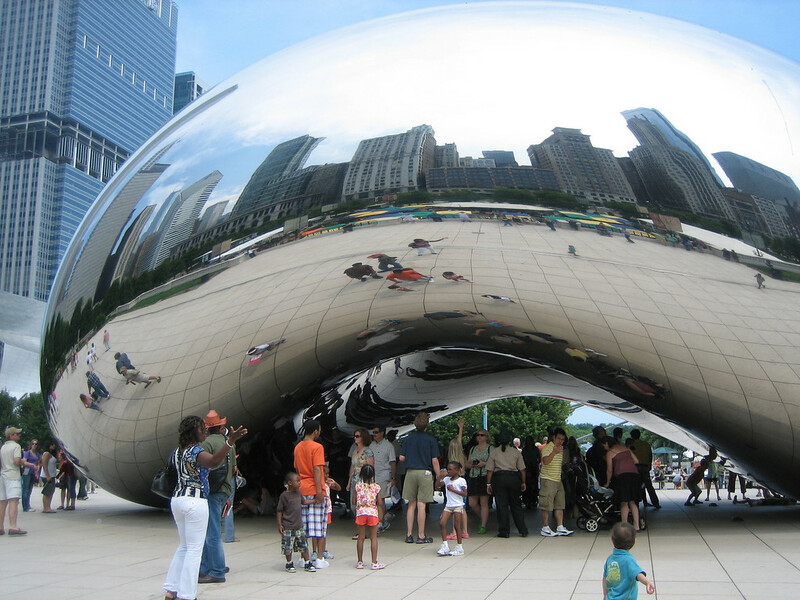 The official name of this big metal reflective object in Millennium Park is “Cloud Gate” but most people just call it “The Bean”. (I heard at least one person say that it was called “The Peanut”). A better name might be “kid magnet” because kids (of all ages) are drawn to this very simple but very large structure. Very cool picture and unique structure. I wonder if there is any story behind this creation. I am fascinated by this sculpture. I have never been to Chicago but when I do go, this is one of the first places I would like to go! Love the reflection of the skyline. I can see why it is such a popular spot. Visiting the Bean was great fun. The whole park is such a magnet for kids–the Crown Fountain and video walls are other favorites that drew a lot of kids to play in the water during the hot, humid week we were there. This is a cool sculpture, I took loads of shots as well as the interactive fountain, Did more photoshooting than attending blog sessions. I heard it took over two years to make and doesn’t have one seam in it. That bean is a photogrpaher’s dream. 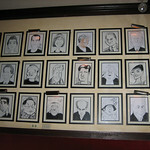 Next time I am in Chicago I will certainly have to check it out! we love the bean. it is such a GREAT piece of public art. excellent photo! I love the way the city is reflected in the bean! This is the most photogenic sculpture I have ever seen. No two pictures of it will ever be the same. You captured it very nicely. Ok, at this point, who wasn’t at TBEX in Chicago:( me! Nice photo. You really captured something of Kapoor’s sculpture. I learned about “The Bean” when a friend, Bob Gottlieb, an alumnus of the University of Chicago recognized that it was by the same artist as the new piece at the Israel museum, but that one makes everything upside down.